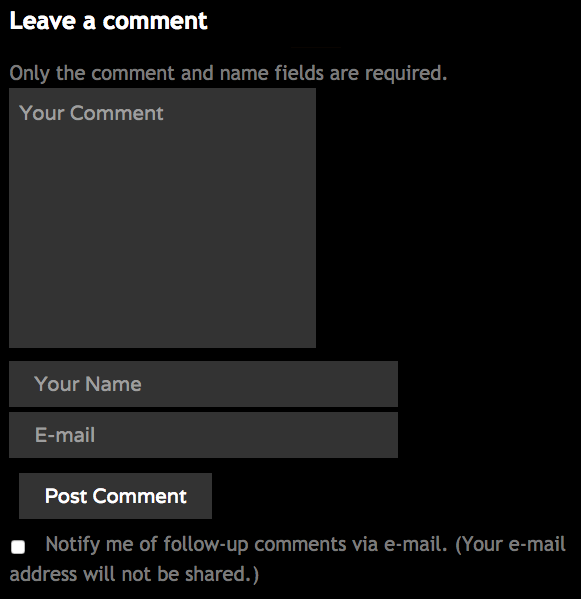 I'm using a plugin called "Subscribe to Comments Reloaded". It actually features an option to do exactly what I want: "If this option is enabled the subscription box will be above the submit button in your comment form." The problem is, when I enable it, the "notify me" box (and accompanying text) disappears completely instead of moving. I'm attaching a screen capture of what my comment form currently looks like. Are you sure nothing get happens with some JS code when "Notify me" button is checked? If this option is enable the subscription box will be above the submit button in your comment form. Use this when your theme is outdated and using the incorrect WordPress Hooks and the checkbox is not displayed. I suggest to you to check the call of your comments template and if an update is available for your theme. Not the answer you're looking for? Browse other questions tagged comment-form notifications or ask your own question. How to remove or customize “Comment” in comments form? Am I using the right hook for removing quicktags on the admin TinyMCE? How to edit comments form on posts? How do I add an extra field to comment form above the submit button?